Canadian public companies have been making greater use of rights offerings according to a recent update from the Canadian Securities Administrators (the "CSA"). Since the rights offering rules were overhauled in late 2015, the CSA reports that rights offerings have increased by approximately 130 per cent, with 60 issuers raising over $500 million prior to December 31, 2017. This trend is likely to continue as issuers gain experience with rights offerings and become more comfortable with the process. Public companies are taking notice of the rights offering as a viable method of raising capital as a result of amendments that were made to the rights offering rules in 2015. The most significant changes were to streamline the procedures for filing rights offering circulars with securities commissions and to increase the maximum number of shares that may be issued under a rights offering from 25 per cent to 100 per cent of an issuer’s share capital. The ability of Canadian reporting issuers to conduct rights offerings was further enhanced in 2017 with the issuance of a no-action letter by the U.S. Securities and Exchange Commission that confirmed that it would not object to Canadian reporting issuers using Form F-7 to register their rights offerings in the U.S. for the benefit of their U.S. shareholders. For more information, please read our BLG bulletin from March 2017. As a result of the changes to the rights offering rules, rights offerings can now be completed in a more timely and cost effective manner. The CSA reports that the average time to complete a rights offering has been reduced from 85 days under the previous rights offering exemption to 41 days from the filing of the rights offering notice under the streamlined rules. The following chart indicates the approximate time and cost to complete a prospectus-exempt rights offering relative to other equity financing methods frequently used by Canadian public companies. Standby Guarantors – lack of disclosure regarding the relationship of standby guarantors with the issuer. Working Capital – issuers failed to identify working capital deficiencies in determining funds available to the issuer and failed to disclose and explain significant changes in working capital. Liquidity – issuers with insufficient funds to cover short-term liquidity requirements and overhead expenses for a period of 12 months did not include adequate disclosure as to their plans to discharge liabilities as they become due, the minimum amount required to meet short-term liquidity requirements and their assessment of the issuer’s ability to continue as a going concern. Allocation of Available Funds – the CSA noted that the level of detail in the breakdown of the use of available funds could be improved and that issuers with negative cash flow from operating activities were expected to provide a breakdown of key expenses for a period of at least 12 months. Closing News Releases – issuers failed to include all required information in the news release issued upon closing of the rights offering. Issuers are making use of the 100 per cent dilution limit – The increase in the maximum number of shares that can be issued makes a rights offering more worthwhile and suits the needs of junior issuers that are most likely to rely on a rights offering to raise capital. Vetting Process – the ability to proceed with a rights offering without any prior review by securities commissions has significantly reduced the time and uncertainty associated with the offering. Rights offering materials are still reviewed in advance by stock exchanges and, accordingly, stock exchange review and the logistics of setting a record date for the distribution and trading of the rights have become the more significant gating items. Standby Purchaser Compensation – the rights offering rules include a separate prospectus exemption for any securities issued in connection with a standby purchaser commitment. Issuers often rely on this exemption to issue warrants to standby purchasers in consideration for their standby commitment. Prominent Risk Disclosure – rights offering circulars require prominent disclosure of the period of time that available working capital is anticipated to fund operations. This may require an issuer to provide greater point-in-time disclosure as to its financial condition than it may have otherwise included in its continuous disclosure documents. Liability Exposure – issuers are subject to statutory liability for misrepresentations in rights offering circulars (or other disclosure documents) to shareholders that participate in the rights offering. Liability exposure has also been a significant factor in considering whether to make rights offerings available to an issuer’s U.S. shareholders. Translation – rights offering documents need to be prepared in both French and English, a requirement that many issuers may not have previously encountered. In recent years, securities regulatory authorities have carefully reviewed the financial condition of issuers conducting prospectus offerings and the sufficiency of the proceeds being raised. As a result, issuers with going concern risk may not be able to readily carry out a public offering without the offering being subject to lengthy regulatory review and the issuer being required to raise a significant minimum amount. A rights offering requires prescribed risk disclosure as to the issuer’s financial condition and going concern risk, but no longer involves an uncertain securities commission review process and, accordingly, issuers with going concern risk will likely continue to use rights offerings with greater frequency. One of the purposes of the rights offering amendments was to reduce the time required to complete a rights offering and this has been accomplished through the streamlined filing procedures. 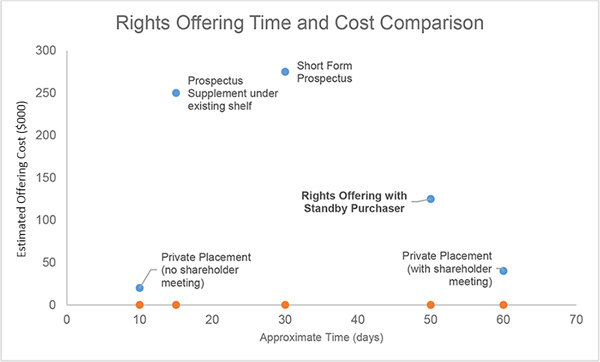 Rights offerings are still not able to match traditional arm’s length private placements or most short form prospectus offerings for speed of execution and flexibility. However, as indicated by the chart above, a rights offering may be an appealing alternative for issuers that are contemplating a private placement to insiders that would involve the time and cost of obtaining shareholder approval under stock exchange policies or securities laws. In many cases, a rights offering with an insider as the standby guarantor may compare favourably with a shareholder approved private placement to insiders from a time, cost and deal certainty perspective.